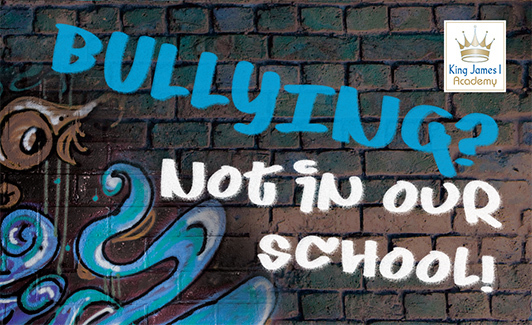 At King James I Academy we take the issue of bullying seriously and our student support staff are on hand to help and offer advice. Students known as "Peer Mentors" have been trained as Peer Mediators and are available to help other students with friendship issues. No one has the right to bully another person and make them unhappy, upset, or to feel bad about themselves. If you are being bullied in any way - get help and make it stop! Tell Someone: Talk to a parent, teacher, friend, Peer Mentor or one of our Student Welfare Workers. Put it in writing: Write a note or fill in a self-referral form and post it in the box in the library or in the English corridor. Someone from Student Welfare will get in touch with you.